In a Dutch magazine there was an interview with this band and the title above it said: "Mad, Math, Metal". It kind of describes the music you can expect. This three year old group with ex-members of N3UK, Smogus and Orphanage hails from the Dutch capital. With their own money they recorded the complete album, artwork inclusive. Already finished half-way 2008 it has taken till now to finally release it. Like so manyother technical mathematic metal bands the music is not easy to consume, but if you take the time and you are a fan of this genre, this debut is no waste of money. With fucked up rhythms, heavy grooves, strange noises and lots of power they take you on a journey. Aggressive vocals go hand in hand with clean ones. Lots of moments the name Mike Patton enters my head during the clean parts. That is a compliment, because the man has got a unique and very good voice. The song "Drone" differs the most from the rest of the stuff - it is a slow kind of mechanical-riffing song as if you are working in a factory at a assembly line. Meshuggah, Textures and The Dillenger Escape Plan are bands that play in the same genre. But it would be too easy to serve CiLiCe of as a clone or copy. Therefore they have to much own elements in their music. 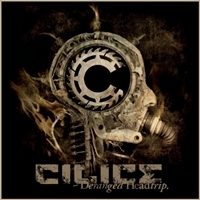 Nevertheless, if you like the other bands, you will also dig 'Deranged Headtrip'. Fans of rather complex music have found a new rising star.